Size of this preview: 800 × 495 pixels. Other resolutions: 320 × 198 pixels | 640 × 396 pixels | 882 × 546 pixels. English: IV-V-I chord progression in C.
English: Created by Hyacinth using Sibelius 5. This media depicts a chord progression outside of a specific musical context. Chord progressions consist of an ordering of chords outside of time or rhythm (no "distinctiveness"), may be used in compositions by multiple composers ("common material"), and may not be readily apparent in compositions. 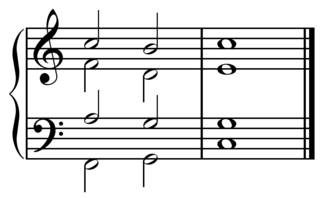 As such, a chord progression is a musical concept or technique, which is considered too simple to be eligible for copyright protection, or which consists only of technique, with no original creative input.